I try to keep all of my none-brush tools in one place. 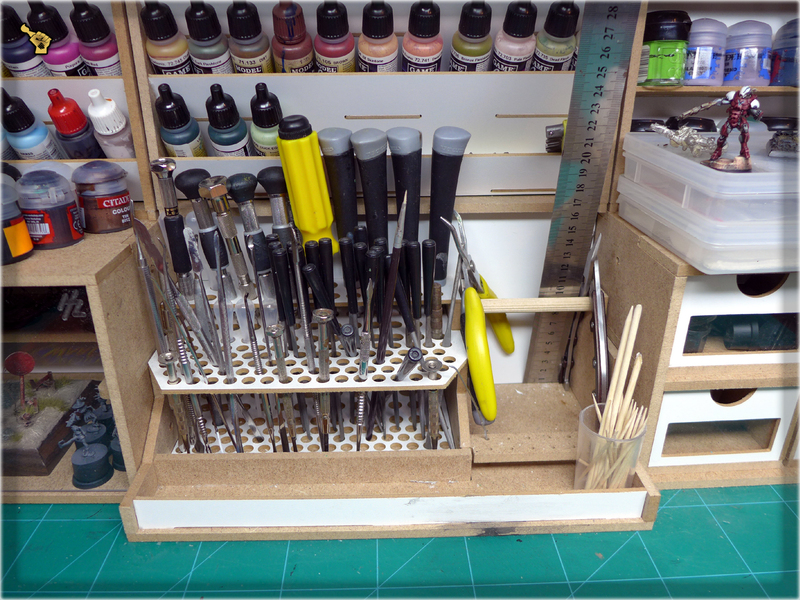 A single HobbyZone Modular Brush &Tool Organizer is a wonderful gadget to keep the tools in but before I got one I just used a metal can. I also preffer not to keep the tolls locked in a drawer. It is easier to see the tools all the time and just pick the right one instead of romp in a drawer. 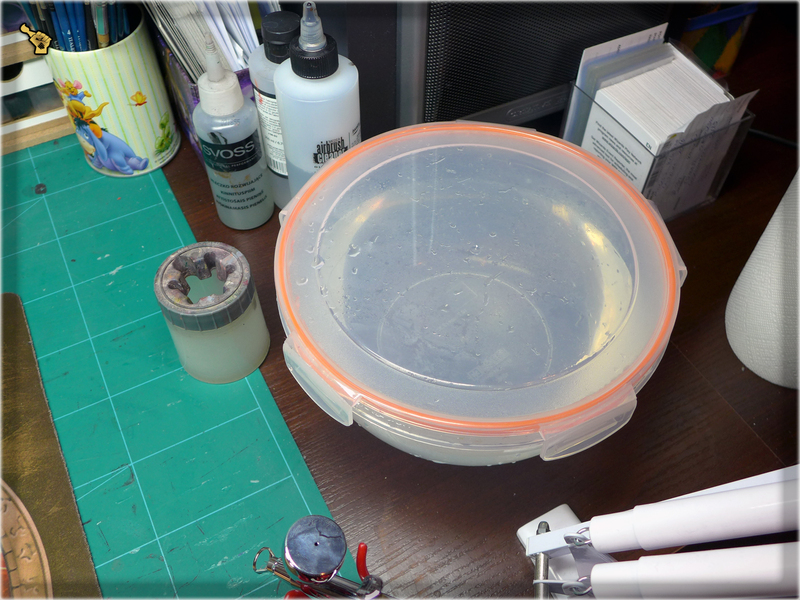 I used to keep water in two Games Workshop’s water pots but after I spilled it all over the workbench for a thousandth time I went to a local supermarket and spent that 2€ on a bowl with solid cover. It keeps the water clean without the need to change it every couple of hours, stops evaporation and most of all it prevents me of spilling water during cleanups. I still use GW’s water pots but not within the bounds of their designation. 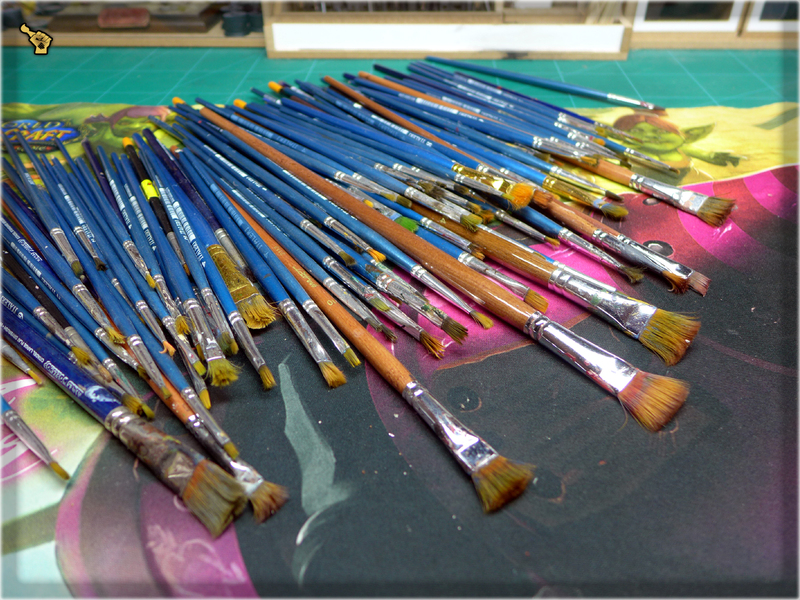 Once a hobbyist is strongly into painting the brushes collection expands to an enormous size. The reasons are many. Brushes tend to get damaged, get old and shaggy and some are being repurposed after a period of time. It is good to keep the ‘priority’ brush set as a whole and apart from the rest. For example in a special organizer or a can so that it can be moved to other places without the need to split it. Once a priority set is estabilished you will be able to draw a brush from it without considering if it’s of good condition. (That is if You are keeping the priority brush set updated). 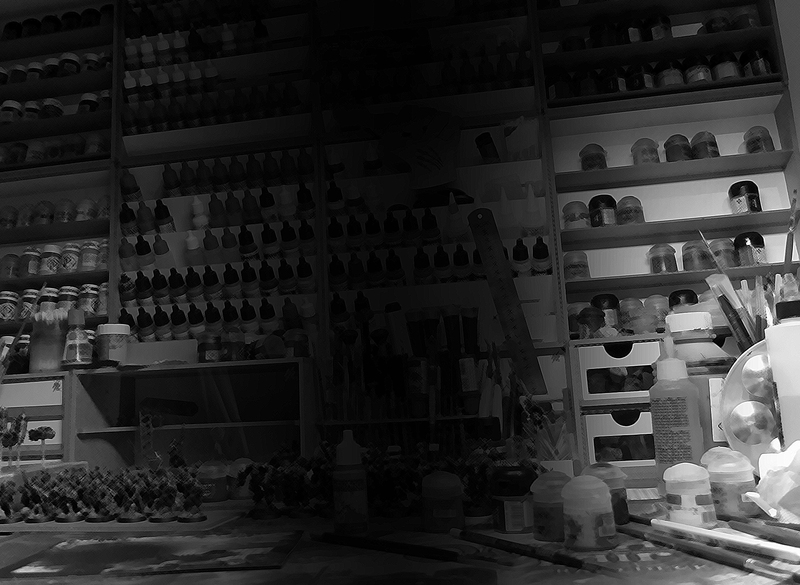 I know the looks of a stockpile of miniatures at different stages of paintjob being thrown all over my desk. Utter chaos and lack of organization resulted in some projects being pushed ‘for another time’. Sometimes it took years to finally get to work on a particular project. 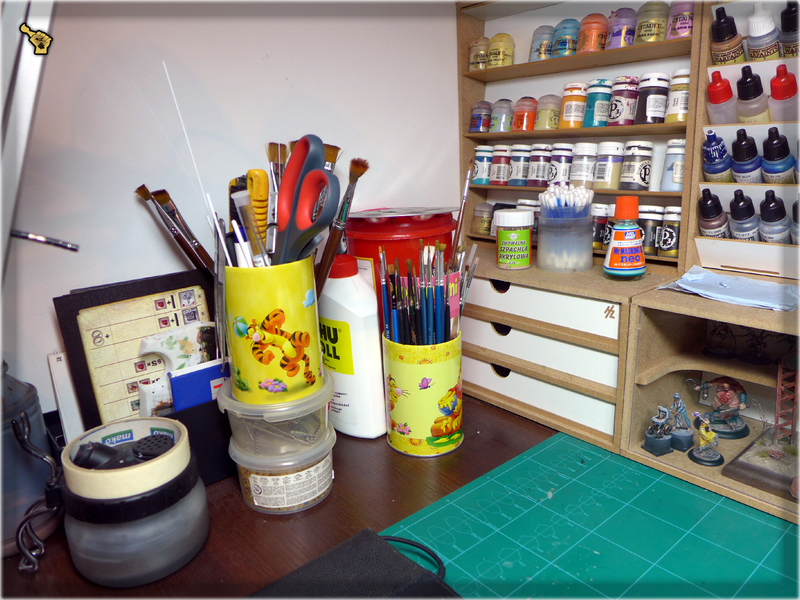 Nowadays I tend to keep all of my future projects (both commissions and my private collection stuff) ordered and organized in separate boxes. 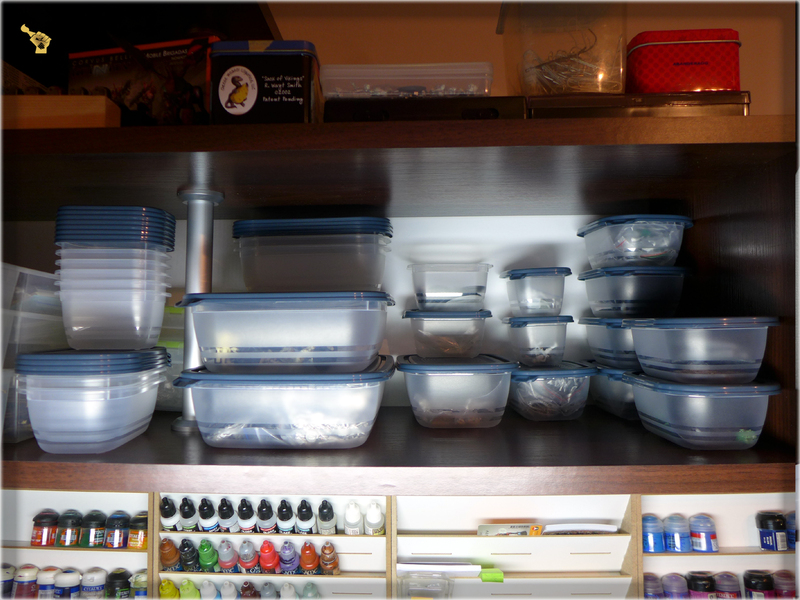 I keep all of them at sight as it lets me plan a probable execution queue and keeps me motivated 🙂 I recommend to purchase some cheap, clear, plastic kitchen containers. Once again a local supermarket is a good place to look for these. The ones in the picture costed me less than 8€ for a complete set of 25. 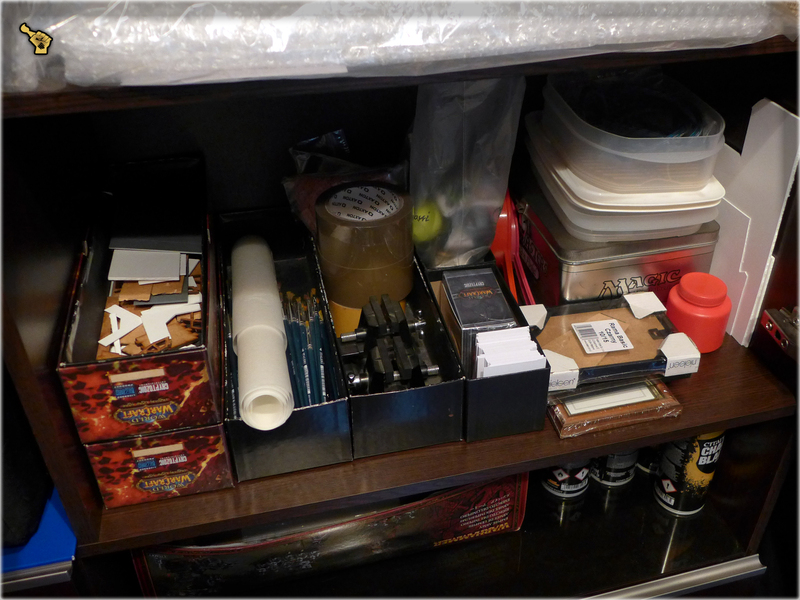 Kitchen paper, plasticard, small rocks, pieces of cloth, modelling sand, pieces of cork, airbrush cleaners, toothpicks, sealing tape, cardboard, plastic sprues, static grass, etc… all the imaginable sizes and purposes of stuff! All of it should be kept in a rather orderly manner. 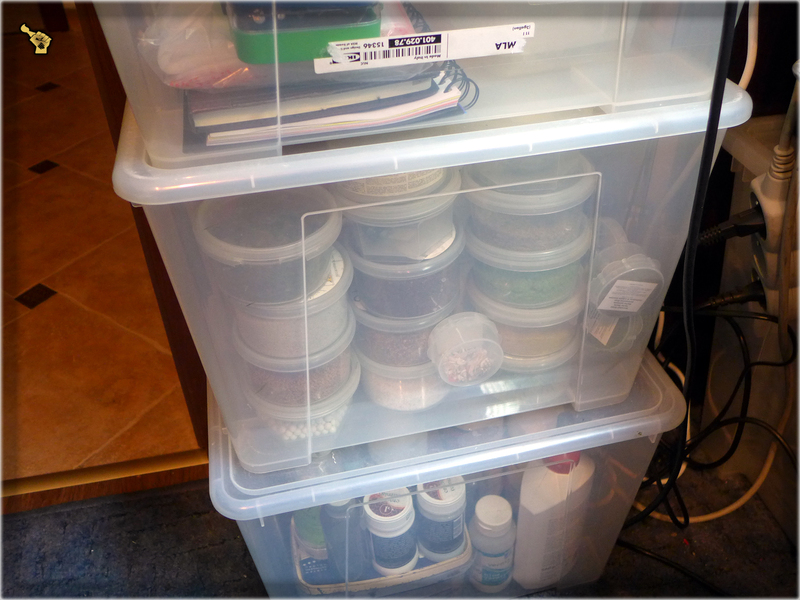 I recommend some clear containers once more, much bigger this time tho 🙂 Some similar sized boxes are a good idea too, especially if you have a locker to keep them in. If I’d only done this when I used to play Lego blocks. 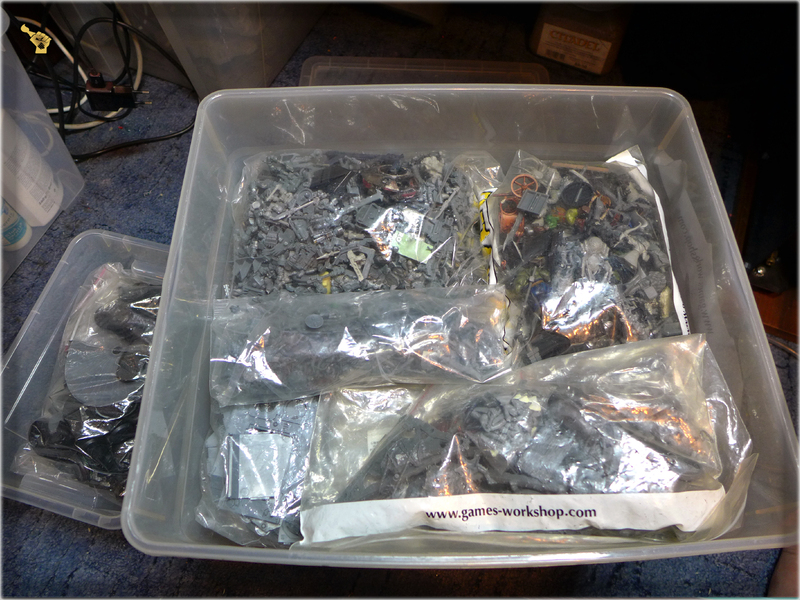 Bitz and miniature parts are not so much different than Lego. They too have a variety of shapes, value, purposes, rarity and belong to certain sets and themes. 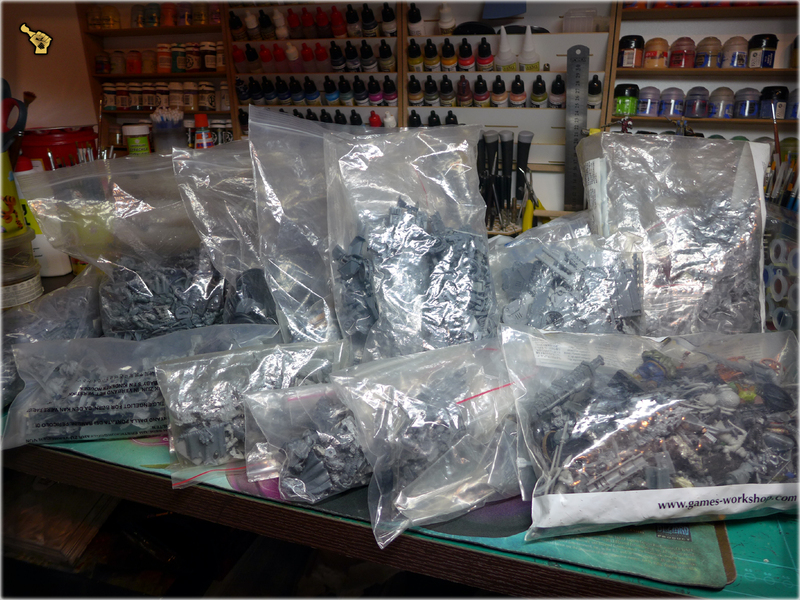 The best way to keep your bitz in order is to segregate and keep them zipped in clear bags. 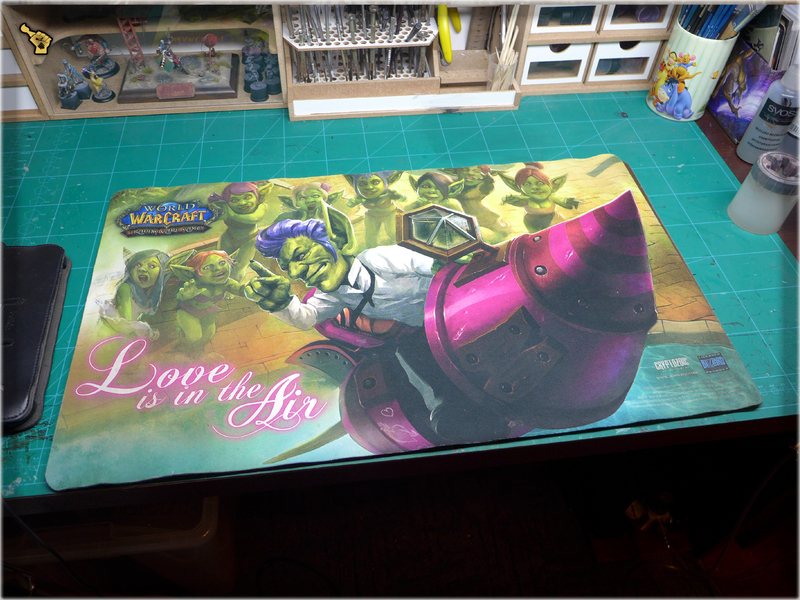 It also speeds up the process of finding particular pieces on demand. I know – it sounds rather discouraging but once it is properly done it will stay that way for years to come. When you tend to not use a particular thing for a really long time – it probably means that you will do much better without it. Escpecially when it comes to particular paint colours or used up brushes. Think of them as thing that take up space and disorganize your working place. [WARNING] Do not trash these things tho! There’s probably a nice local hobby store where kids learn of how to paint – your shaggy brush is theirs ‘dream come true undercoater’! Cleaning should be a natural habit. Cleanups are best performed regularly as otherwise you risk growing lazy and overcomed with mess. 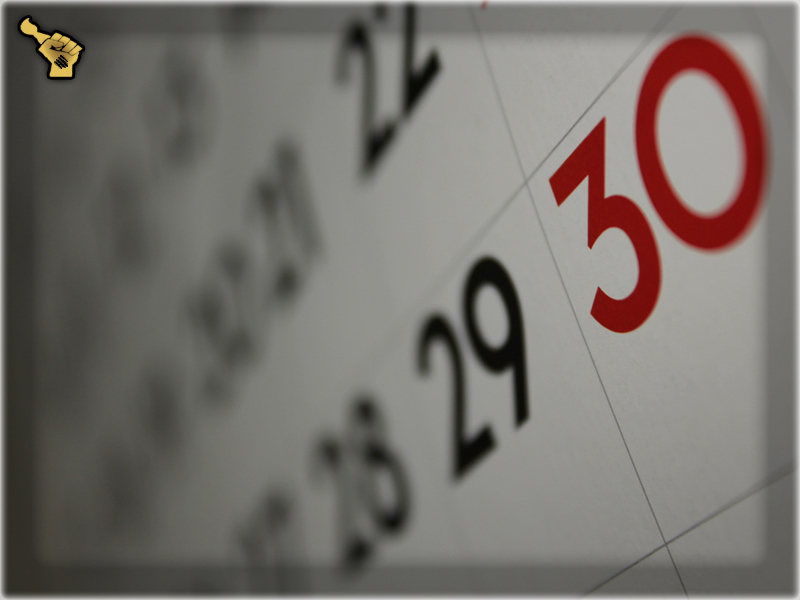 The more often you do them the less time consuming it will be. So now go and clean up your workbench! 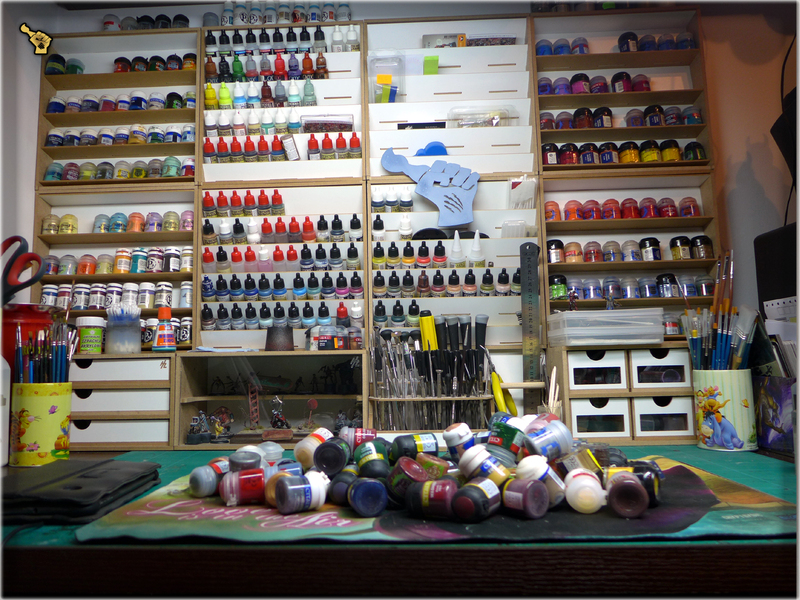 Take a picture of it after you’re done cause next week it might prove helpful – a christmas giveaway in form of a nice and rare miniature will go to one of the hobbyists who’ll happen to shows me their clean and organized hobby workbenches.